So if you’ve been following my twitter feed, you’ll have maybe noticed my recent announcement. I was sort of forced into doing it last time (around October last year) due to being made redundant following the release of Kinectimals. During that time I made Soul Brother, but was re-hired at Frontier. I began working here again in December, and have been for the last four months. I’m working on a great project, which I can’t reveal of course, so really my choice has nothing to do with dissatisfaction from work. During this time back in the industry, I’ve had plenty of time to think about the possibility of making the indie hobby into a career. As I enter my mid-30’s, I realise I’m not getting any younger. And as I have been given some financial leeway by the sale of Soul Brother, there really is nothing else stopping me from taking the plunge. So, for the second time in a year, I’m announcing Superflat Games is my full-time job. And this time for good hopefully! I’ve set up a real business account, and put my life savings into it, which should keep me going for close to a year. I hope to finish Legend of the Starmen in less than 6 months though. Anyway, I look forward to sharing proper progress with you guys. And I suppose it’s a good time to announce I’ll be adding the usual Donate button to the site when I am self-employed next month. If you’ve ever enjoyed my work or want to help me keep making it, you could always send a few bucks my way… Money is a bit more of an issue being self-employed when you have a wife and child to support, but if I do ok from a future game I’ll be sure to take it down again! Anyway, here’s to the future, beautiful games and indie life. So! There’s more news to share. Two games in particular I’d like to talk about. Another game I started at TIGJam, and a second collaboration with Terry Cavanagh. This is an RPG, presented in Colecovision. It plays out in the world of Danszen, where everybody’s dancing all the time, even in their sleep. You play young Shimmy who, under the forceful encouragement of his mother, must rise to the top of the ranks, defeating the experts in the three ‘ways’ of dance: Rock, Soul & Electro. I’m super excited about this project, it’s using the RPG engine Terry’s been building for his latest project, Nexus City (with Jonas Kyratyes). I’ve always wanted to make an RPG, Terry and I frequently wax lyrical about our love of the Persona series, and Final Fantasy of course. So as soon as Soul Brother is out, and Terry’s schedule is freed up a little, we’re gonna plough into this. 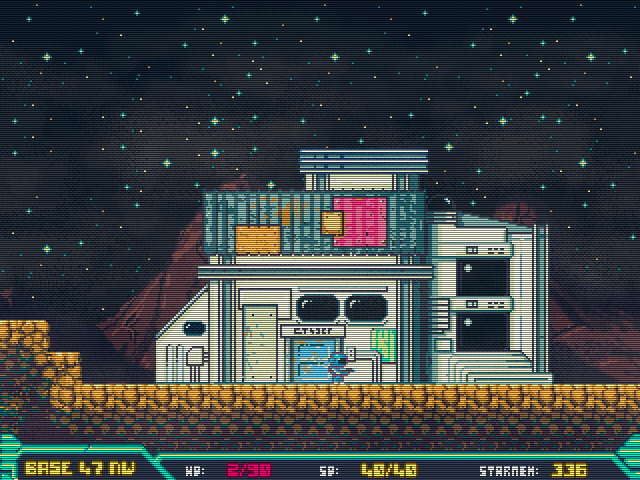 Based in part on Trip:One, the scrolling gravity-’em-up I abandoned last year, this is my latest love. I’m so into this project right now – let’s hope that feeling stays with me! Legend of the Starmen is an action RPG. You play a space mercenary, from a race of people who are born and die within their suits (although they may change and modify them, their religion forbids them from seeing what is inside.) You belong to a government-run group of soldiers who harvest ‘Starmen’ from planets long-abandoned. Starmen are nomadic beings made of pure star-energy. They land on these deserted worlds and build basic societies from the wreckage left there. They are considered not to have rational thought or feelings, although they will protect themselves when threatened, by inhabiting nearby machinery. They are also the most valuable commodity in the galaxy, because they can be converted to astronomically powerful energy, used to fuel weapons, ships, and all the necessary gear to survive in outer space. This is why your group exists. But is there more to Starmen than just the energy they contain? I don’t want to spoil too much more about the game – I doubt it’ll be out until the end of the year at the earliest. Suffice to say this is my main focus, and I will do all I can to finish it. I’m basing the mechanics squarely on Demon’s Souls, one of the greatest games of all time in my opinion. Starmen act as currency and a means to upgrade oneself. Dying (and hence dropping them) will only give you one chance to return to get them, or they’ll be lost forever. Each level has no checkpoints, and must be completed in one go, else the player must return to their base to save. In addition, the player has an energy bar which functions much like stamina in Demon’s Souls, so it won’t be a case of simply spamming the fire button – choosing when exactly to use one’s energy is key! To round it off, you can change and upgrade suits, find and carry multiple items, both weapons, secondary-effect-items such as shields, or simply healing items, any of which you can upgrade too. This should give the player a lot of variety in play-style. Anyway, that’s the plan, let’s see if I can actually make it now! I’m pleased to say the spam filter seems to be doing its job – all 1278 are gone! – so let me know on Twitter or info [at] superflatgames.com if you’ve tried to comment but nothing’s got through.